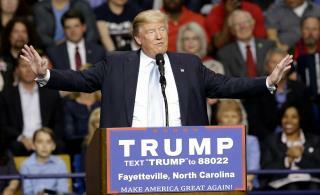 (Newser) – Authorities in North Carolina say there isn't enough evidence to press charges against Donald Trump for his behavior in connection with a violent altercation at one of his rallies last week. In a statement Monday night, the Cumberland County Sheriff's Office said legal counsel advised and Sheriff Earl "Moose" Butler agreed that the evidence doesn't meet the requisites of North Carolina law to support a conviction for inciting a riot. The sheriff's office said while other aspects of its investigation are continuing, the investigation related to Trump and his campaign is over and no charges are anticipated. An earlier statement said investigators were continuing to look at the rally last Wednesday in Fayetteville, during which a man was hit in the face while being escorted out, the AP reports. The Left have a long history of inciting violence. From their days of KKK lynchings to the radical bomber Bill 'Unrepentant' Ayers sixties terrorism, to BLM riots. It's just what they DO. Historical FACT.